David Hackenberg began his career in beekeeping while in High School and today his family-built operation transports more than 3,000 hives all over the country. This process is called migratory beekeeping and helps pollinate much of our nation’s fruit and vegetable crops. To see just how many crops are affected by bee pollination, see Wikipedia’s list of crop plants pollinated by bees. As with all other shipping operations, our cargo is valuable and Hackenberg Apiaries takes every precaution by employing safe drivers, reliable equipment and unique bee transportation methods. Hackenberg Apiaries is a licensed and bonded freight shipping and trucking company that takes pride in their unique and careful operation of transporting bees for pollination across the United States of America. 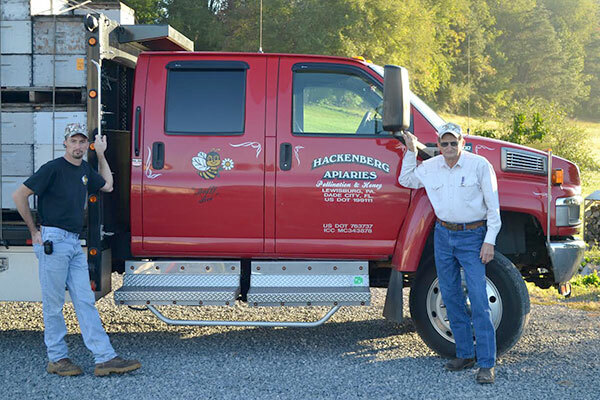 To learn more about how Hackenberg Apiaries transports their valuable bee hives, visit our Pollination page.